One of the most memorable covers in the Prog's history, no? Ranson is generally thought of as a 'serious' artist (whatever that means). Photo-realistic faces. Lines everywhere. Hyper-exaggerated facial expressions, coupled with hyper-subtle expressions. Nihilism. Boundless imagination. 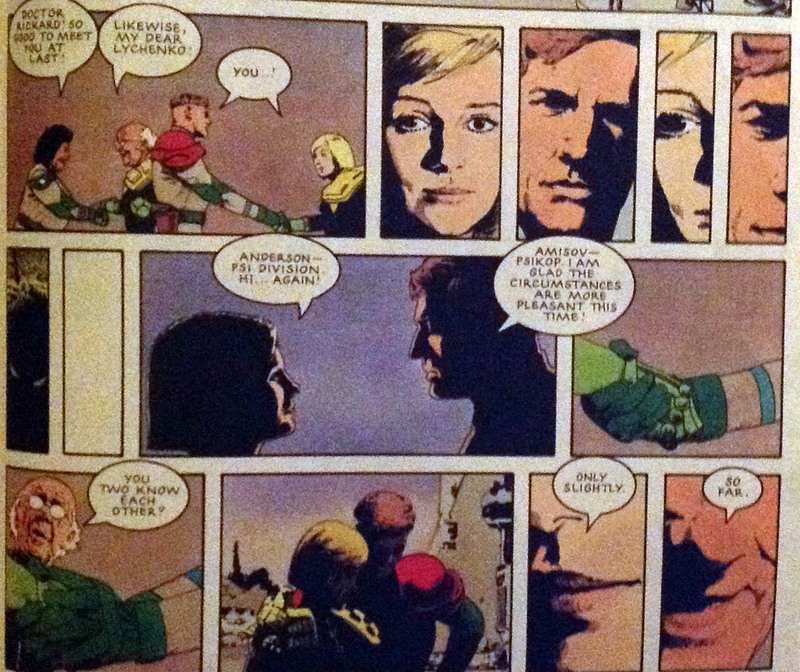 Drawing attention to the design and layout of a page, especially through panel shapes. Drawing outrageously weird things in such as way that it looks is if they’re from a photograph, even though they couoldn’t possibly be... Teasing out themes, emotions and human psychology through art. Matter-of-fact cruelty. The spider in its web is a visual metaphor. I wish more comics artists would do this sort of thing. 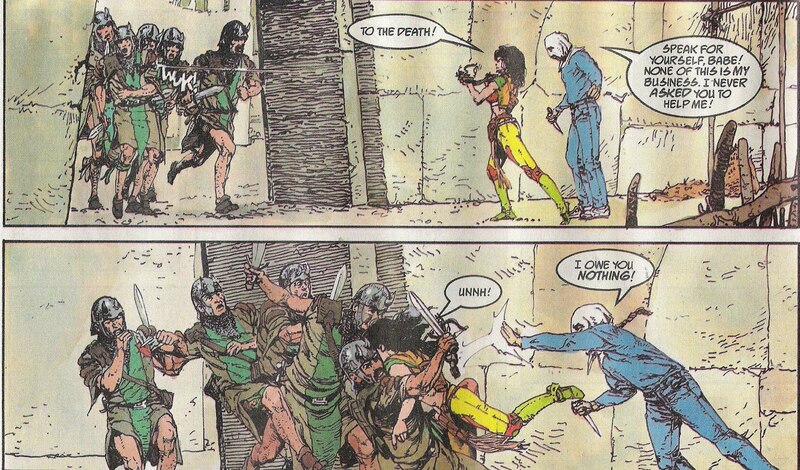 Never pick up Hitch-Hikers in Mega City 1. That’s a hell of a way to grab the readers’ attention! 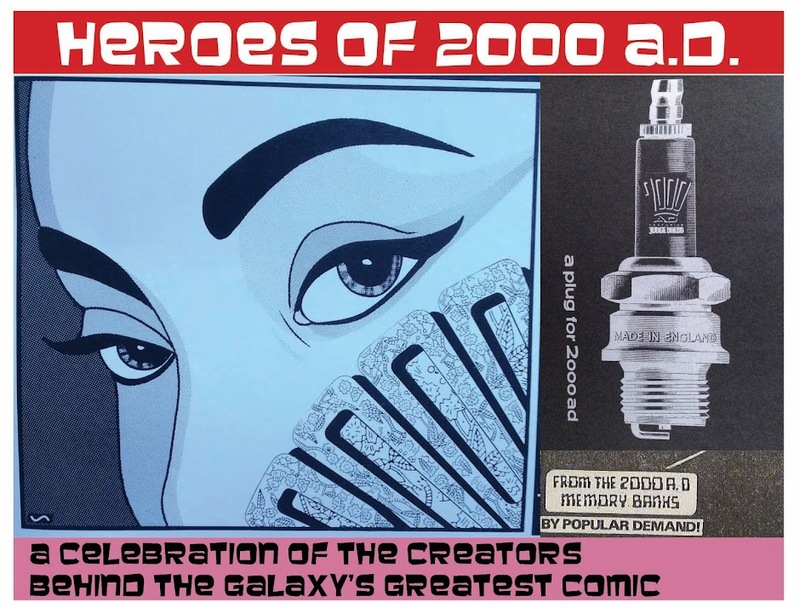 I’d not seen the man’s work before, but he was, at this point (1989) something of a UK comics veteran, most known I gather for drawing TV tie-in comics that drew heavily on his ability to draw photo-realistic looking characters. I’m going to go ahead and assume that Ranson did indeed use photo references for much of his work – presumably, like plenty of artists, actually staging and taking photographs before rendering them as often as not – and leave us not forget that photography is every bit an artform. feels not unlike a UK tabloid photo-strip. This never happened in a tablid photo-strip! And it's from the very next page of the same story. …or being plagued by a flying ship full of demons. THIS is what they want to see. Gorgeous blue and brown painting, too. But to be honest the real draw of Ranson, for me, is not the straight-up brilliance of his draughtsmanship, it’s the imagination he brings to the characters and above all they way he plays around with the form of comics. 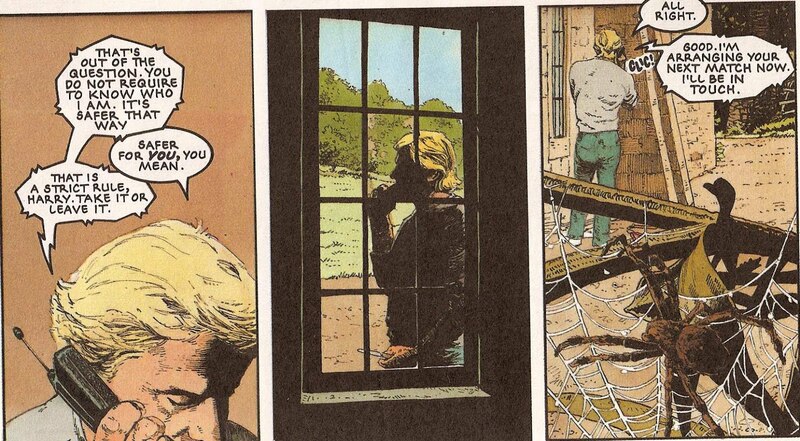 Yes, he’s benefitted from basically only working with John Wagner and Alan Grant, two of the best writers in comics, but his work with those two is also some of their own very best work, and that’s no coincidence. 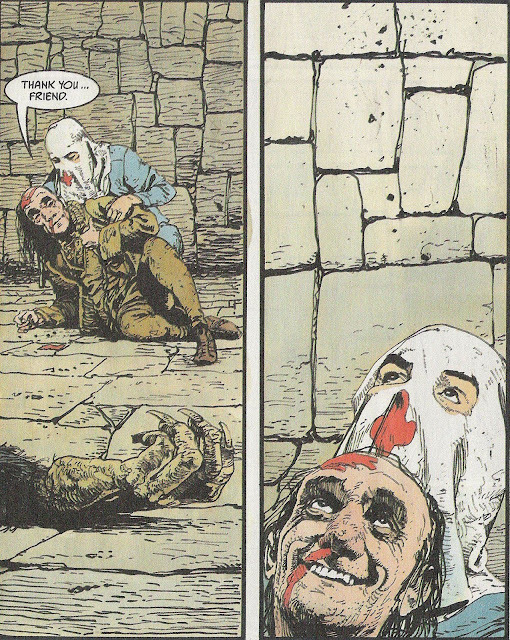 It's also no coincidence that Tharg himself, who very rarely pays to print creator-owned strips, made exceptions for Arthur Ranson TWICE: Button Man is © John Wagner & Arthur Ranson, and Mazeworld is © Alan Grant & Arthur Ranson. I've no idea how he achieved this affect in 1989 - I guess photocopiers were involved. Ther point is, it's playful and serves the story well. 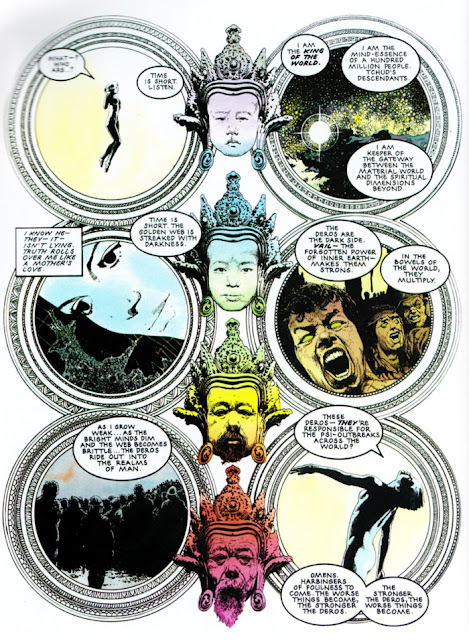 I admire Anderson: Shamballa far more than I actually enjoy reading it, and I think perhaps both aspects are largely down to Ranson’s art. He fully embraces the mysticism the underpins the main part of the story, from the god/demon war for the world aspect to the falling in love subplot. But it’s not exactly a hard-action classic. And no, they don’t all have to be action stories, but there’s something about the formalism on display that made the story feel a bit too much like homework. Sure, homework set by Alan Grant***, who would be the most fun teacher ever, but still homework, y’know? 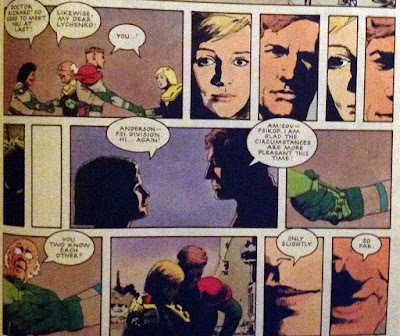 The panel layout does a lot of the heavy lifting to show these two telepaths falling in love. The circles! The detail! Is it trying too hard? Or just hard enough? 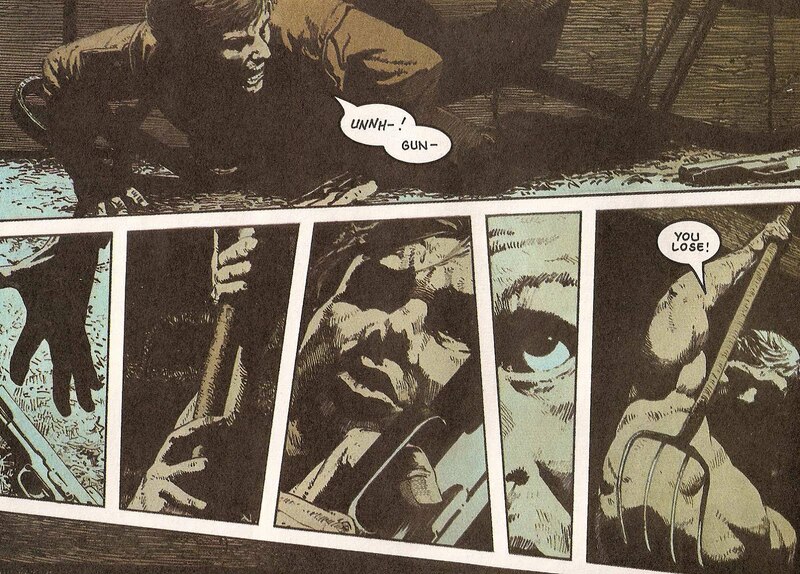 As it happens, Ranson’s very next project would prove to be one of 2000AD’s best-ever hard action classics, Button Man. A whole heap of the praise goes to John Wagner, but the way Ranson guides the reader through the locations, the suspense and above all the a-b-c thread of each button-man battle is just exquisite. Harry Exton is indeed a cold fish. It’s the exact opposite of Michael Bay style editing craziness, in that you can see who is doing what to whom, where they are, and how every punch, kick, stab or gunshot makes perfect sense. And then there’s the matter-of-fact nihilism. So much thought into the panels, adn the thigns you see within each panel. And a little homage to Hitchcock's Psycho, just for fun. Again, this is as deeply Wagner-esque**** trope, but Ranson must have an affinity for it, too, as he imbues Harry Exton with such a cold personality, and the whole series has such an air of emptiness and lack of hope. 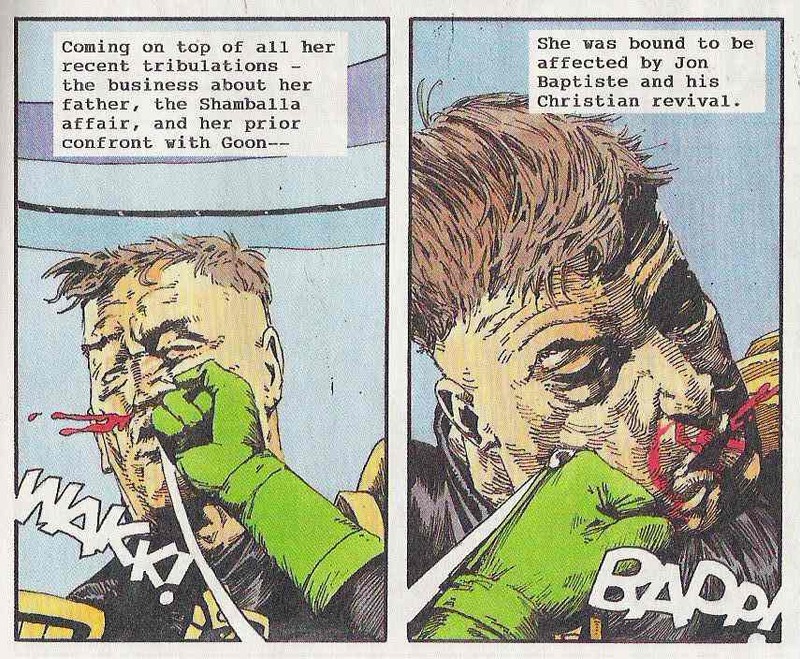 And let’s not forget the character design for Harry’s Voice, one of 2000AD’s most cruel villains. Come on, that's 'The patriot' era Mel Gibson, right? and if they didn’t quite reach the same emotional/thriller highs as Book I, they absolutely increased the nihilism. Harry’s ability to fake his way through a marriage and indeed through a life in isolation were in equal measures abhorrent and compelling. 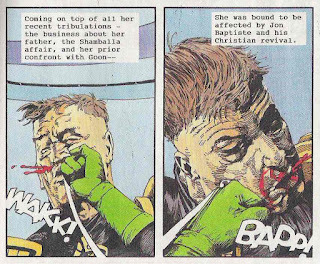 Meanwhile, Ranson was busy bringing a much-needed touch of class to the Judge Dredd Megazine. The long-running Anderson vs Goon plot in Anderson, Psi Division genuinely kept me waiting for each new issue, and it’s obvious that Ranson was a big part of this when poor newcomer Yan Shimony was dropped in the deep end with his chapter. 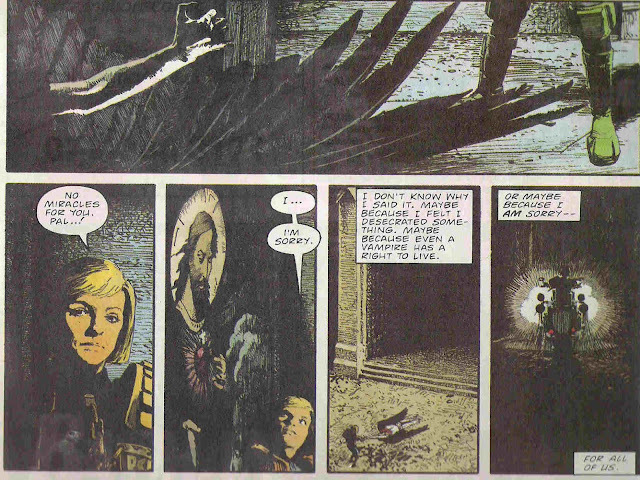 Anderson's encoutner with a vampire, and then Jesus, sets off a long-lasting chain of emotional and story turmoil. The much-heralded Satan storyline was perhaps the big draw for the launch of Megazine Volume 3. Storywise, it didn’t live up to its billing, but by gosh there’s some meaty artwork to enjoy there. I have to admit to being a little let down by Ranson’s design of Satan himself – but by the end of the story it’s clear he couldn’t go any other way than depicting a medieval-style version of an actual fallen angel with massive horns. 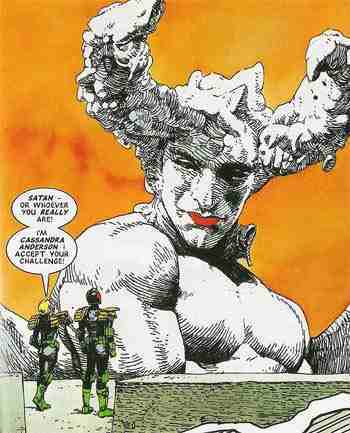 Perhaps by direct contrast, his next major Anderson epic, R*Volution, was all the better because villain Vernon D’Arque had one of the best ever character designs. Aa snkae and a gorilla fight for their souls. No holds barred weirdness! 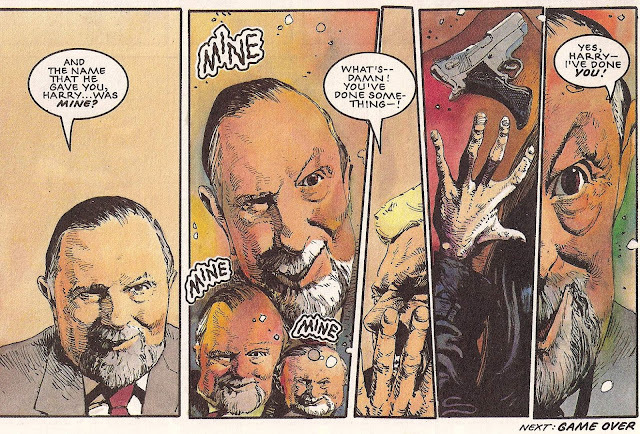 I remain mystified why this story isn’t much more fondly remembered and talked about – possibly it suffers from its context of a not-great period of 2000AD, and the valid complaint that the events affecting Anderson, Psi Division where almost entirely ignored by contemporary Judge Dredd stories. In any event, Ranson put Anderson aside for a time, and birthed Mazeworld. And, in a way, this series is the ne plus ultra of Arthur Ranson. There’s nihilist characterisation left, right and centre (but especially in the ‘real world’ portions). Adam Cadman's journey begins. Was this effect achieved with computers? I don't think so. When a ray of hope does come, it's all the more moving. Look at the joy in their eyes! There’s wild flights of imagination, not least in the architecture of the Mazeworld, and of course there’s huge helpings of playing around with panel structure, page layout and formalist comics goodness. I mean, it’s called bloody Mazeworld and he draws a whole bunch of panels to look like mazes! It would almost be offensively dumb if his labyrinth designs were any less gorgeous. I've yet to gush over teh exquisiste detail in Ranson's backgrounds. Just look at the wear on those stones! After the tale of a hanged man living in a fantasy world that may or may not be all in his mind, we segue to Ranson’s final cycle of Anderson, Psi Division – in which our Cass lies in a coma (sort of? ), with her mind free to exist in a fantasy world that may or may not be the actual homeworld of one Sidney D’eath, teenage superfiend. Ranson puts Anderson through a whole heap of emotional paces over the next four stories, which sort of merge into one (although that’s partly a side-effect of the way they appear in the Case Files reprint). Half-Life, the parasitic Psi-demon implanted by the Sisters of Death – or at least, I think that’s what it is – is creepy as hell. More fun is ditzy pyrokinetic not-really-a-Judge Juliet November, an original creation Ranson dashed off for a Dredd episode over in 2000AD, but a delightful supporting player in Anderson, Psi Division. She’s overdue for a re-appearance! Oh Juliet, will you ever get it together? Every long-running comics hero has a montage page of all their old foes. Here's Ranson doing that for ol' Cassie Anderson. Mazeworld: definitely for the art more than the story, although the story has many merits, too. 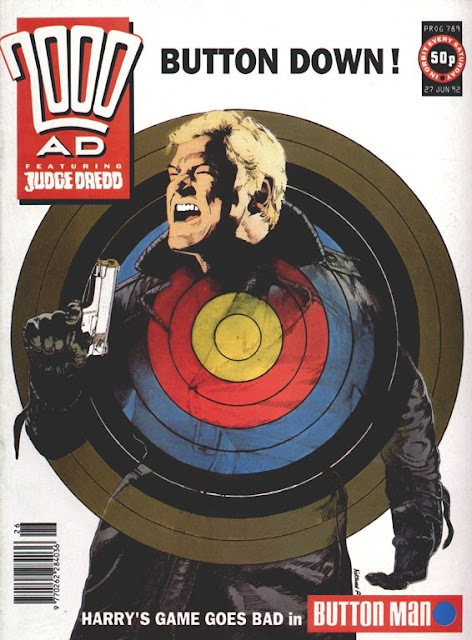 *OK, so technically his first was a Judge Dredd story from a special, but this Anderson may have seen print first. ***Grant sometimes strikes me as the real-world equivalent of DJ Chris Stevens from Northern Exposure. But this isn’t the place to go into that. 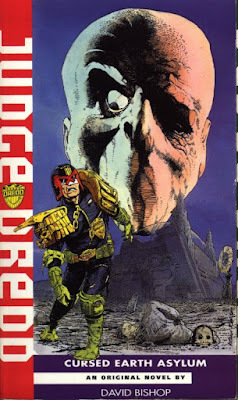 *****And it’s only just occurred to me that at roughly the same time, Carlos Ezquerra and Alan Grant where putting Durham Red through very similar paces, to equally good but less celebrated effect. John Bolton's art is reminiscent of Arthur Ranson's, although I'm not suggesting there's any copying going on. Yeah, Dowling is the obvious inheritor of Ranson's crown, but I think that may be a direct result of his working on Ranson's signature strip. I'm not sure Dowling's work was quite so Ransonic (c) until he was given a crack at Mrs Anderson's little girl.